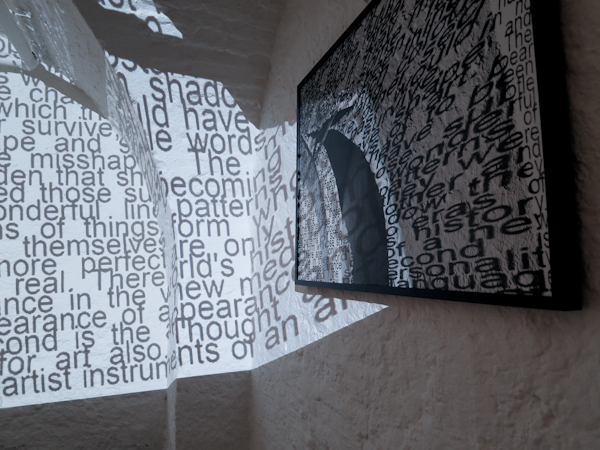 installation “interpolation” in their own way: The starting point is a text that is re-formulated by the method of text synthesis. Sentences from the source text are moved out of their original context and reassembled to a new text. This creates a text with a completely different content, while the original sentences are still the same. It can be understood as an excessive form of interpolation in the literary sense. The Picture of Dorian Grey by Oscar Wilde is starting point for the textual intervention. characteristics of the space as well as its distinctive contrasts of light and shadow. By that the text interpolates – in the mathematical sense – the installation from the sentences. The installation itself consists of three photographs. They are architectural details of the vault, which were alienated by superimposition, creating new forms and structures. 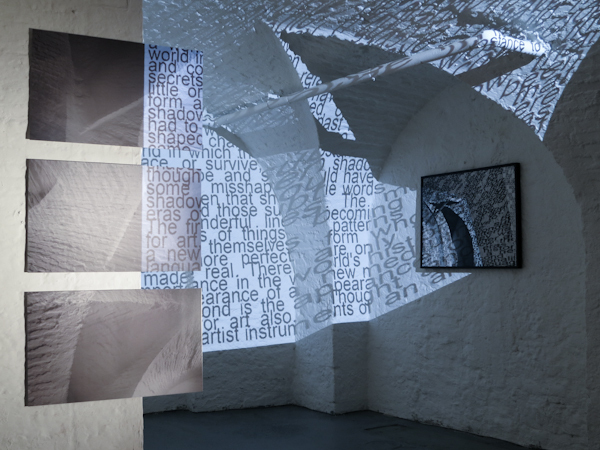 In a further step, the generated text becomes a part of the installation, by being projected onto the arches of the vault and the photographs. The text is distorted and follows the curves of the vault while emphasizing the shapes creating highlights and shadows. The interaction between the found architectural features and the projected text suspends the distinction between the work and the space around it.By using different forms of citation text and installation form a Möbius strip of self-reflection.